I am writing to you on behalf of my cousin and friend, Scott McKeel. 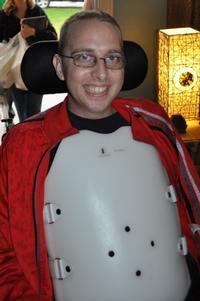 In August Scott suffered a life-changing spinal cord injury as a result of a devastating fall. His spinal cord was severed, leaving him a paraplegic with no use of his legs. Additionally, he suffered a traumatic brain injury that limits his ability to speak and write. Scott spent months in a rehab facility and is now living in his mother’s home where he continues to receive therapy. Scott graduated from Beaver High School and then attended Duquesne University where he received a Bachelor’s degree in History. He then went to Ohio Northern University in Ada, OH where he graduated with a Juris Doctorate in law and passed the Pennsylvania Bar Exam in 2008. Until his accident, Scott worked as a bankruptcy attorney in Pittsburgh, PA. Prior to his accident Scott enjoyed reading, traveling, attending sporting events and golfing. Now he spends his days learning life skills to adapt to his wheelchair as well as continuing to work on his ability to speak and write. The road he faces is long and difficult, but he keeps a positive attitude and focuses on the fact that he is a miracle, rather than on the pieces of his life he lost due to the accident. Scott believes that he will one day return to a productive life in the community with the support and assistance of his family and friends. Even with insurance, Scott faces many uninsured, injury-related expenses such as: the cost of home modifications, co-pays and deductibles, rehab therapy, alternative therapies just to name a few. This presents a financial challenge to Scott and his family as it is estimated that they will need to raise approximately $80-$125,000 for first year expenses. The Center for Disease Control and Prevention estimates that average lifetime expenses for spinal cord injury patients range from $500,000 to 3 million dollars. To help with this financial burden, a fundraising campaign in Scott’s honor has been established with HelpHOPELive (formerly NTAF), a nonprofit organization that has been assisting the transplant community for nearly 30 years. All donations are tax deductible, are held by HelpHOPELive in the Mid-Atlantic Spinal Cord Injury Fund, and are administered by HelpHOPELive for injury-related expenses only. Please consider making an end-of-year, tax-deductible contribution today.Scott’s family and friends also are continuously planning fundraising events including bake and rummage sales, spaghetti dinner and golf outings, and we gladly welcome volunteers. Please e-mail [email protected] to volunteer. Thank you so much for any help you can give to Scott and his family.